1986: Doctor Who - Looking Back At THE MYSTERIOUS PLANET | Warped Factor - Words in the Key of Geek. When Doctor Who came back in 1986, it was a programme on a mission. It had taken its first bloody nose in over twenty years, being pulled off the air after a single season of the Sixth Doctor. It was a programme increasingly misunderstood and disregarded by the senior executives at the BBC, and with a style that had arguably coarsened its attitude towards explicit violence in Colin Baker’s first season: Lytton’s bleeding wrists in Attack of the Cybermen; the acid bath quipping and the Doctor personally springing the trap which kills Quillam in squirming agony in Vengeance on Varos; the Doctor personally throttle-poisoning Shockeye in The Two Doctors, again quipping to the corpse; and even Peri getting in on the murderous action in Revelation of the Daleks. It was in danger of marginalising itself and it had its credentials as the cornerstone of family viewing to re-establish. It had to prove it could do what it had always done – win families to sit together for 25 minutes a week and cheer for a hero. What the Trial season delivered, in hindsight, was absolutely the wrong way to go about doing that job – one overarching storyline over fourteen episodes, in an era when much of Britain still saw TV as a watch-it-or-miss-it event, made it easier for people to get lost. And the trial structure itself seems misjudged on two levels – it keeps interrupting the action for irritating dialogue at one remove, and if you’ve been off the air for eighteen months, it’s only wise to come back and put yourself on very public trial if you smash it out of the park, and the Trial, for many reasons, doesn’t. In The Mysterious Planet though, there is a very strong drive towards renaissance, towards back-to-basics adventuring in a classic Doctor Who style. In fact it would be hard to find a more classic, safe, straightforward offering than the basis of The Mysterious Planet. It’s right there in the title: what’s Doctor Who about? Going to mysterious planets. Bang, there you go. What’s more, for its first screen time in eighteen months, John Nathan-Turner brought back former script editor and frequent scripting gold miner Robert ‘The Governor’ Holmes, to give us a couple of hours of running about with savages, very thirsty people in Tube station and a great – arguably the greatest – Holmesian secondary character double act ever, in Sabalom Glitz and his partner Dibber. But before we even got there, the Production Team were making statements. Fans are still divided over this thirty years later, because we really know how to hold a grudge, but The Mysterious Planet opened up with a brand new theme arrangement. And it was, at least to this fan, bouncing up and down in anticipation of the return of the brash, bold Doctor in his paint-explosion coat, a massive disappointment. At thirty years’ remove, you can see the point of Dominic Glynne’s arrangement – going back to the more spooky, mysterious, ‘Ooh, who is the Doctor?’ vibe of the utterly classic original version, only spangled and twangled for the eighties audience. It was an attempt to soften the programme’s offering, to make it ‘more like people remember’ for fans tuning in after the long Who-drought, and for people who weren’t fans, but would be checking what Doctor Who was like these days now it was back. But the visuals of the title sequence weren’t changed accordingly, so to many, it felt weak, lacking the undeniable punch of Peter Howell’s version. 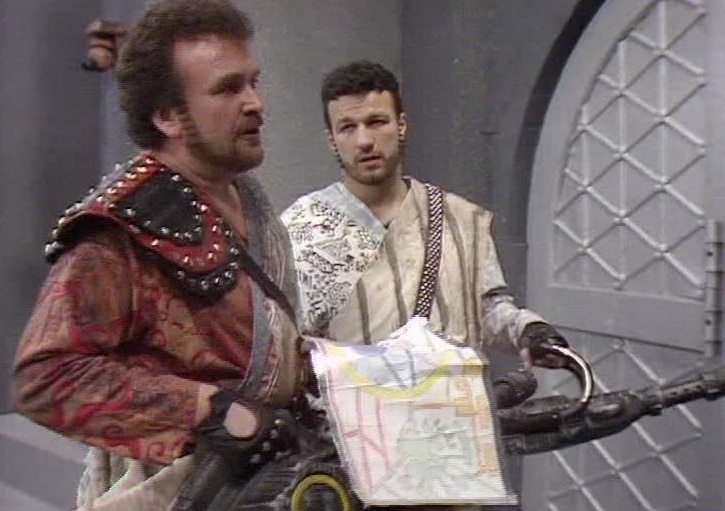 Now, when it gets going, The Mysterious Planet is a really good, fun, utterly unchallenging and unthreatening Doctor Who story in the Classic tradition, not least because it’s a Robert Holmes showreel of the best bits of his Who-writing career. Strange planet, with a problem. Bizarre coincidences – finding Marble Arch Tube station overgrown with foliage on an alien planet. A drab, humourless society, as in The Sunmakers. The Tube-dwellers make perfect sense, and yet at the same time, there’s a whacking great slab of satire in there, the society held in rigid, need-based stasis by a robot who can’t see beyond the remit of his function (Holmes re-pulps the central idea of the Sontarans in Drathro. He will execute you rather than help you, because there’s a protocol to maintain). A resistance movement – Merdeen’s runners, who become the Tribe of the Free. A kerfuffle over a bit of high technology treated as a sacred artefact (as in The Ribos Operation), two of the brightest students chosen to go and help the alien lord in his castle (The Krotons), and the fantastically rogueish (and here, more than ever again, more than a little psychotic) Glitz and Dibber, like Garron and Unstoffe turned up to eleven, with Tony Selby as Glitz stealing many scenes. The point about The Mysterious Planet is that it’s a great, enjoyable, clever, logical, satirical and character-rich Doctor Who story, of the kind that Robert Holmes could deliver in his sleep, with both hands tied behind his back and a woodpecker on his head. The Production Team luck right the hell out with guest actors too – Tom ‘Duggan Lives!’ Chadbon turning in a very different performance as Merdeen, Joan Sims, bless her, clearly having no idea what she’s taking part in, but giving it her spirited all as Queen Katryca anyway, Adam Blackwood giving Balazar a naïve charm that makes the his cluelessness all the funnier, and Tony Selby striding and conning his way through the whole thing like a gleeful combination of Arthur Daley and Slippery Jim DiGriz. 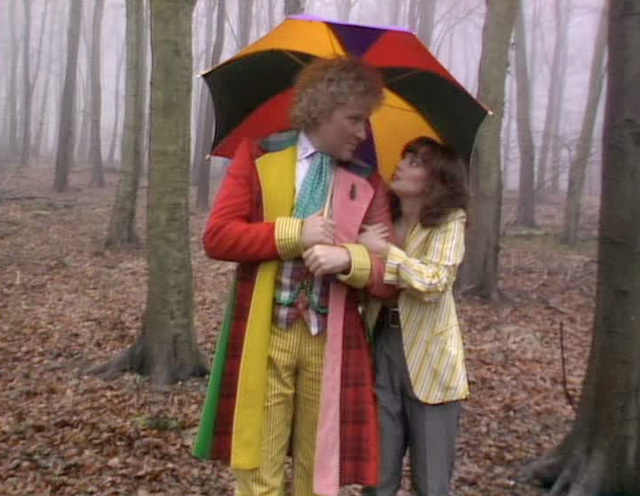 It's important that during the eighteen months we’ve been away, there’s been a thawing of the relationship between Peri and the Doctor, and Holmes in The Mysterious Planet gives us a glimpse of the Sixth Doctor and Peri as we could have enjoyed them going forward. 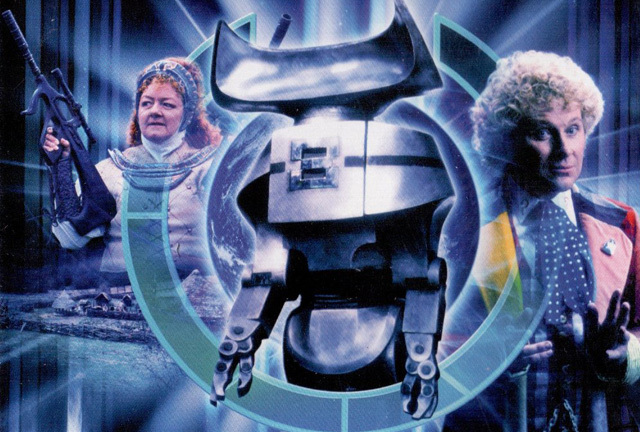 The L1 and L3 robots, while not exactly sophisticated, are certainly a cut above the likes of the Sontarans and the Borad from the previous season in terms of believability, and left alone, The Mysterious Planet would have been a cracking, if ultimately inconsequential return to the storytelling values of Tom Baker’s time – if never a Robots of Death or a Pyramids of Mars, then certainly on a par with stories like The Android Invasion or The Hand of Fear. But it couldn’t be left alone. 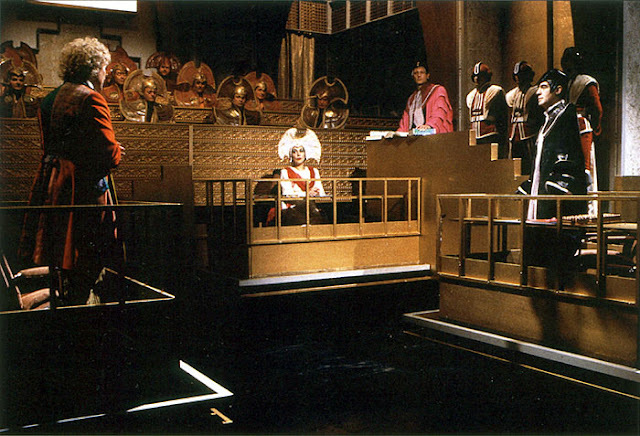 Holmes was saddled with the trial format to work into the story and there seems to be a note of Holmes the storyteller injected into the Doctor’s frequent and tiresome interruptions – ‘Are you really offering this inconsequential silliness as evidence?’ Perhaps the episode 1 climax is the ultimate example of what is wrong with The Mysterious Planet. A perfectly good cliff-hanger – the Doctor being stoned to death – is sacrificed by a return to the courtroom, and the Doctor voices the opinion of viewers when he says ‘Oh, why did you stop it at the best bit, I was rather enjoying that!’ There’s more tedious toing and froing between the courtroom players, and the episode ends not with actual peril being shown, but with Michael Jayston’s Valeyard telling us all of peril, and that the Doctor’s life is in danger. While bowing to no-one in my appreciation of Michael Jayston and his voice, it’s no substitute for a good stoning (and the fact is, it’s a cliff-hanger that’s repeated almost verbatim at the end of episode 4). The trial sections ruin what would otherwise be a perfectly serviceable runaround story to open Season 23, robbing it of impact and drama, and adding nothing but court dialogue and tedium. The Mysterious Planet is still highly watchable popcorn Who after thirty years. But a special edition with all the court segments edited out would be far more actively entertaining. Twitter campaign, anyone?